Chris Handy pinged me on Twitter a couple weeks ago to ask if I wanted to preview his Pack O Game set, coming to Kickstarter on August 4th. You may be familiar with Chris through his previous games, like last year’s fantastic Cinque Terre or 2009’s Long Shot. The Pack O Games collection of card games is a bit different from that other fare. To begin with, it’s much smaller. How small? It’s so small… I can easily fit all five games in my pocket… at the same time. Being a connoisseur of all things pocketable… and… games… I decided this was a preview that I wanted to partake in, so I set down my newborn baby and said “yes” to Chris. Baby can wait. There are games to test. I noted a couple of things when the games arrived and I unpacked them. First… they are incredible tiny. Each one is about the size of, perhaps… a pack of Hubba Bubba gum. Second, they all have simple three letter names. The games are HUE, TKO, FLY, GEM, and TAJ – the latter of which will apparently become the first of a few potential stretch goals. They all look so good! Which one to try first? When I unpacked the Pack O Games, I immediately took to HUE. I don’t know why. Maybe it’s because I have a friend named Hugh? Maybe the box was upside down and I read it as 3nH, which stirred my inner chemist? I think it’s more likely that I just really dug the design of the stark design of the HUE box, which whispers of the design on the cards within. Wanna see how tiny HUE really is? Deliciously tiny. Okay, nice… so what’s this all about then? HUE is a game for 2-5 players, lasting about 10 minutes. It’s almost a kind of tile laying game, using cards. You and your opponents are trying to build large areas of contiguous colours (or “colors” for all you crazy people) and attempting to outscore one another by scoring bigger areas than your opponent. Three cards are dealt, in staggered fashion, in the middle of the table. These are the starting cards that each of you will connect off of. Each player will start with five (or six in a 5-player game) cards in their hand. One of these cards is a “poison” card. Players take turns playing a single card as their action, connecting it to what already sits on the table. You don’t need to connect colours together, but you must place your cards so a square side touches at least one full square section of another card in the playing area. Everyone will play all but their very last card, which will be used as a “scoring card”. The three colours (of the five total in the game) on that scoring card will be the colours you personally will score, and you’ll score based on the largest contiguous area of that colour in the play area. 1 point for every small rectangle, or 3 points for every large square in that area. Poison cards can be attached to a contiguous area to render it valueless, causing your opponents to curse your name. Damn you! You poisoned my well, son! etc. So in the situation below, you’ve got a big purple contiguous area made up of 12 potential points, but the poison card rendered it useless. So, if you were scoring purple, you would need to move on to the next biggest area. In this image, that would be 3 points. Ultimately, games of HUE will end up looking a bit like the above… a veritable potpourri of colour! It’s like something off a console on the bridge of the original Enterprise – a complicated weave of squares, rectangles, and hues; and I haven’t even talked about how you can play a card overtop of a full square on another… (you can do that). It’s a little reminiscent of western dominoes, but in some ways the pattern building is quite a bit trickier here, especially being able to overlay cards and break up contiguous areas. What did HUE think of it? Though each player only plays five cards, and it’s a short game… this is a sizzling brain burner. You need to be careful of giving away what colours you’re going for, because your opponent might poison them or block them out with their own cards. Creating big swaths of blue might seem like a good idea, but if your opponent is letting you get away with it (or worse, is helping!) then you’re likely both aiming to score blue. This deduction element is huge. HUE feels unlike any game in my collection. It’s quick and easy to play, grabs your attention, and demands creative thinking. Despite it’s small size, I suspect it would take ages to master this game, and I admire that. Though all the games in the Pack O Game collection seem like they’re pretty portable, HUE probably requires (moreso than others) a solid surface to play on. This isn’t a game you would want to play in the tent, or on a picnic blanket… since the alignment of the cards is pretty critical. You really need a solid surface. 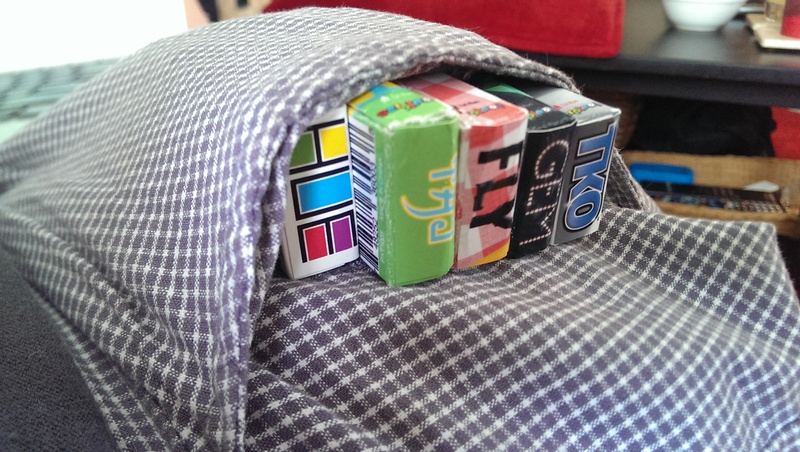 I also feel like, as a travel sized game, a bit more attention might have been paid to ruggedizing the tuck box. The cards themselves are laminated nicely enough, but the tuck boxes could be a little tougher, or maybe even hard cased! That would make HUE, and the other Pack O Game games some truly huge contenders in the travel game arena. It’s impossible for me to judge the component quality. The preview copy I was sent is a homemade, pre-production copy. The tuck box cardboard quality you can expect to see in the Kickstarter reward will be a grade higher and professionally assembled… so my previous misgivings about the durability of the box is pretty unfounded. I wouldn’t be surprised if the cards were slightly different in quality as well, though these pre-prod cards are pretty nice already, and I wouldn’t want them too much thicker. I give HUE four undressed meeples out of five. What about the rest of the POG?! TKO, a boxing game for two players. FLY, a dexterity game where 2-4 players try and swat flies and collect sets. GEM, an auction game where 2-4 players try to amass as much wealth as possible. TAJ, where 2-4 rug collectors vote on shifting around cards to help their secret colour schemes… this is also the longest game in the set at 20 minutes. Overall, it sounds like a diverse collection of tiny games. Normally, this is the type of thing where we would see the individual games come out as PWYW (Pay What You Want) items on Kickstarter, but as a set, it’ll be interesting to see how it fares. I know I’ll be interested in seeing the stretch goals that didn’t make it in my preview copy!